The subject that started as a philosopher’s idea remained without demonstration for more than two thousand years. In the meantime, astronomers reflected upon planetary formation and evolution theory, created models and forecasted the existence of planets around other stars. On the other hand, fiction embraced the idea and many authors dreamed about multiple exotic planetary systems, interstellar travel and life in other worlds. Actually, some of them became blockbusters such as Star Wars and Star Trek. The dimensions of our universe are overwhelming and hence it is difficult for us to visualize them. We never interact with such large distances, forces or speed. The Milky Way is approximately 80,000 light-years across and contains about 100 billion stars. The stars that we see on a dark night with our unaided eye are very close to us. Indeed, most of them are within a radius of 36 light years. However, it is still extremely difficult to find planets around them. Only in the last 20 years have astronomical instruments and telescopes allowed us to use indirect methods to infer the existence of planets around other stars. In this branch of science, finding earth-like planet that can support life is the Holy Grail. Supporting human life requires that several conditions be met. Firstly, the planet must be rocky and about the size of the earth to have reasonable surface gravity acceleration. On larger planets human-kind life would be difficult due to the excessive weight experienced by the human body. Secondly, the planet should be in the habitable zone, which means having an orbit such that the surface equilibrium temperature would allow the presence of liquid water. Finally, the planet should contain water, and ideally oxygen- and carbon-based molecules, such as methane, to make life possible and sustainable. Since 1995, when Mayor and Queloz discovered “51 Pegasus b”, the first exoplanet around a sun-like star, a wide variety of planets have been found using different techniques. As technology improved and telescopes were increasingly employed to detect exoplanets, the number of discoveries grew rapidly, particularly in the last 5 years. These discoveries are mainly due to the availability of very sensitive instruments, capable of measuring the motion of the host star or variations in the intensity of its light. Such motions and variations are caused by the presence of exoplanets and thus are used to indicate their existence. Examples of these advanced instruments are HARPS (High Accuracy Radial velocity Planet Searcher, a ground based radial velocity instrument in Chile), and the Kepler space telescope. At the time this article was written, there were 723 confirmed exoplanets plus 3160 candidates. In less than 20 years technological progress has unleashed the discovery of a planet extravaganza that has surpassed the anticipations of philosophers and science fiction writers from two millennia before – from extreme planetary systems around neutron stars, to the recent discovery of super earths in habitable zones, such as Kepler-62f – only 40% larger than the earth and likely to be a rocky planet. Among this family of planets we find all kinds of exotic worlds, such as Kepler-16b, also dubbed Tatooine, for it resemblance to Luke Skywalker’s home in the movie Star Wars. This planet, located 200 light-years away, is orbiting a binary system composed of a sun-like star and a red dwarf. As a result, two sunsets and sunrises can be seen each day from the planet, as depicted in the movie. Recent exoplanet discoveries not only surprise us because of their diversity, but also by their proximity to our solar system. In fact, last year a planet was discovered around the closest star to the earth, Alpha Centauri b. The planet is similar to the earth in size, but is too close to its host star, resulting in extreme surface temperatures of approximately 1500˚C. However, this planet was discovered at the sensitivity limit of the most advanced instrument of its kind – and there is no instrument available today to tell us if there is another planet like the earth within the habitable zone of Alpha Centauri b! To understand the challenges of finding exoplanets, we can imagine how a sun-like planetary system would appear at a distance of 36 light years (most stars we can see on a dark night are within this distance). Such a distant star would be barely visible to the naked eye. However, this distant star would still be 10 billion times brighter than its orbiting planet. Even if exoplanets were brighter, their proximity to the star would make them almost impossible to see – somewhat as impossible a task as distinguishing a one foot gap from 400 miles away. These are the extreme conditions of contrast and angular separation that make the study of exoplanets such an elusive target for scientists and astronomers. Discoveries from the Kepler telescope are allowing us to establish surprising statistics about the planet population of our galaxy. Data shows that approximately 15% of the stars in our galaxy have a planet similar to the earth. That means that out of 100 billion stars in our galaxy, there are about 15 billion earth-like planets or almost 3 planets per person on earth! 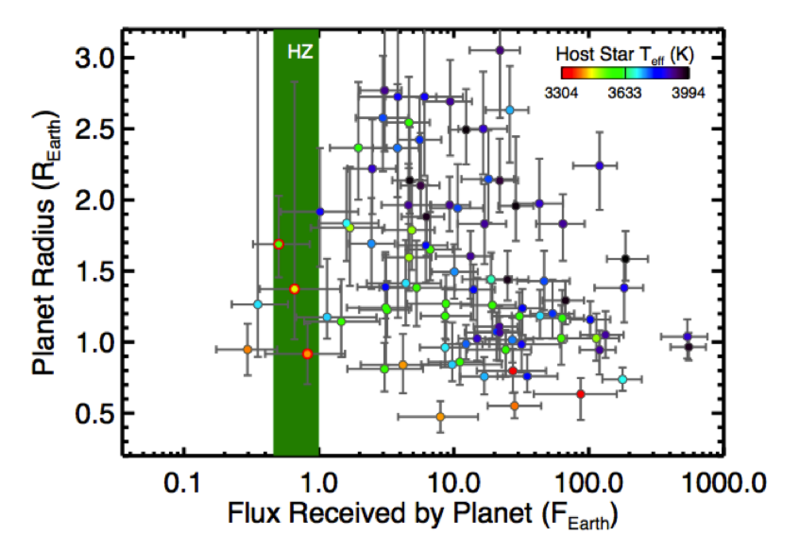 This plot, from the Kepler telescope, displays a sample of planets located around cool stars (<4000K) as a function of the flux received (light intensity) at the planet’s surface, and their radius. Three planets of them fall in habitable zone and exhibit a radius smaller than twice that of earth. Credit: Dressing, C. D. & Charbonneau, D. 2013. Exoplanet science promises exciting times ahead. By next year, two very powerful planet hunting instruments, The Gemini Planet Imager and Sphere will come online in the Atacama desert in Chile, offering the unique capability of taking direct images of giant planets. Afterwards, a NASA space mission TESS, scheduled for launch in 2017, will continue Kepler’s work for nearby stars. By the end of the decade, the James Webb Space telescope will bring more direct imaging capabilities. Hopefully, by 2025, a new space telescope called WFIRST will fly with a specialized coronagraph that may well obtain images of earth-like planets around nearby stars. Around the same time, future Extremely Large Telescopes will begin operation from the ground, imaging planets around dwarf stars. Such direct imaging will allow us to learn about the chemical composition of the amazing worlds that are currently being discovered. It is very likely that this large suite of new technology will cause yet another leap forward in exoplanet science and will again show us that reality can surpass fiction. Eduardo Bendek is a 2008 fellow of the Fulbright Science & Technology Award, from Chile, and a NASA Postdoctoral Research Fellow in the Space Sciences and Astrophysics Branch at Ames Research Center.